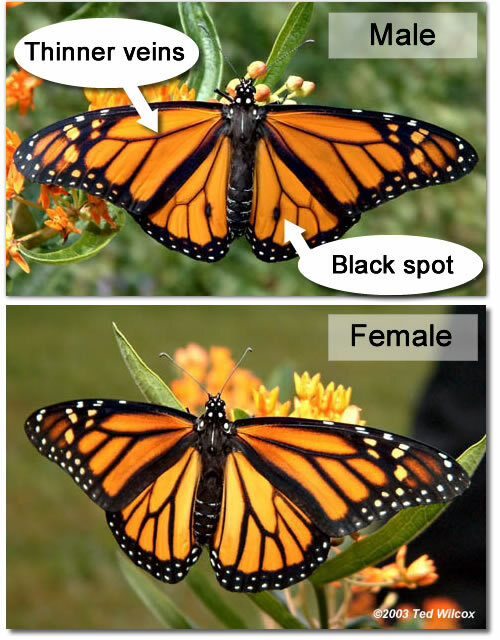 Male and Female Monarch Butterflies: How can you tell? Males have a small black spot on the top surface of the hindwing. Females do not. You can see the spot when the wings are open; sometimes it's faintly visible when the wings are closed, too. Males also have slightly thinner wing veins. — females tend to be slightly darker than males. — the tip of the abdomen of the male and female are visibly different.